Brunch. One that Mom hasn't had to prepare anything for except the belt line she wants to bust out of after. Numbers 1 and 2 are easy enough. Flowers are where things can get a little more complicated — but this is why you have us. Our jobs are to make sure your mama gets the best stuff on her special day, and we make you look like a thoughtful superstar offspring. Put your siblings to shame by getting your mom something a little more personalized than a gift card from Reitman's. We've rolled out some great new products especially for Mother's Day. We have, of course, some themed bloom boxes that are always a Mom must-have, but we've also included some new planter-style arrangements that your Mom can nurture and grow. Odds are you're pretty well grown-up by this point, so why not give her something else to care for while you're out living it up on your own? Once again, you'll notice a jump in prices (just like Valentine's Day), but as we've said before, we're at the mercy of the farms and the wholesalers. Baby Mama Bloom Box - Don't let the name confuse you, this box is not specifically for your baby mama — but don't let that stop you from ordering it for her if that's what you want. Live your truth, baby. This is our Mother's Day Itty Bitty Bloom Box, that same pint-sized, adorable little dude we all know and love, but brimming with the peonies your mama can't resist. Pick your peony colour, and let us handle the rest. Big Mama Bloom Box - Big Mama is back in town and she's teeming with en masse peonies that are sure to melt your Mama's big ole heart. Pick your peony colour and let us handle the rest. You know the drill. Mother's Day Designer's Choice Bloom Box - We get it, picking something perfect for Mom is stressful. You don't wanna just get her the same tired bouquet she gets every year, but you need to find something that evokes who she is as the most special woman in your life. Easy. Give us a vibe, tell us a little bit about her, include her favourite colours if you know them, and our designer's will put together the perfect bloom box featuring beautiful peonies and gardeny enchantment. Thirsty Girls Hydrangea Planter - Here's a classic for Mom that's sure to please. Hydrangeas are one of the ficklest of flowers because they're such thirsty girls. So, to keep these water-suckers thriving, we've planted them in sleek cement vessels that, with some love and lots of water, will keep them blooming longer than ever. Just remember that their thirst is real. We recommend watering every 1-2 days in the centre of the pot to make sure the soil stays nice and moist. Phyllis 2.0 Planter - Remember Phyllis from Valentine's Day? Well she's experienced a seasonal glow up, and she's tripled in size and elegance. 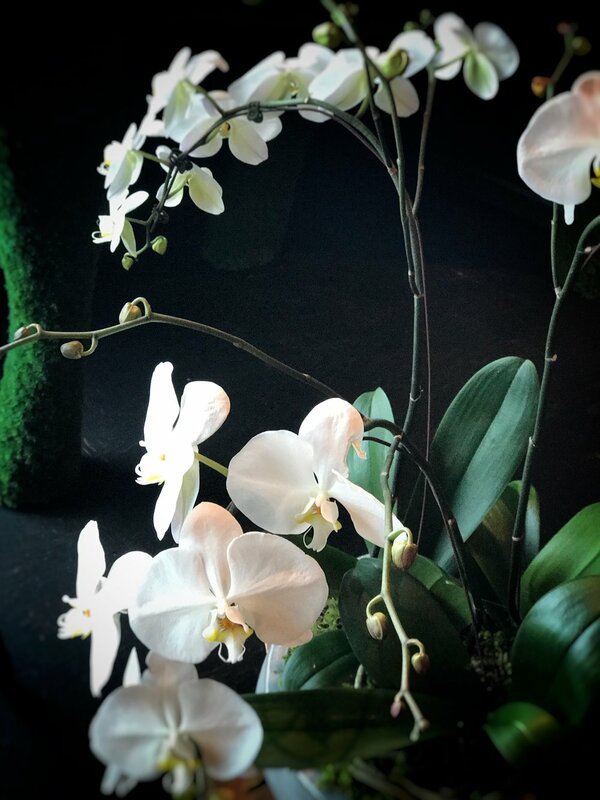 These three phalaenopsis orchids are planted with care into a chic cement planter that's sure to standout as a centrepiece in any room. With proper care and attention, these beauties will last for months. With Mother's Day coming up, get into your mom's good books by using Phyllis 2.0. If you've got siblings to compete with, blow their gifts out of the water with this baby. (Or you can just give her this because you love her or whatever — your choice). The Little Prick Planter - We don't know if you've looked outside lately, but, long story short, it's ugly. So, what better way to help your Mom escape the drab and dreary snow/sleet/rain thing we've got going on than with this desert oasis? It's got cacti of all shapes and sizes and pops of colour that'll make her feel like Elizabeth Taylor sailing down the Nile, and, hell if you take her out for a quick jaunt outside you might both actually sail down the freaking Nile. So don't be a prick, buy one of these for your mom! Sarah Bernhardt - Did you know that Roseanne has a fabulous, (slightly) estranged stage actress for an aunt? Don't feel bad, we didn't know either until Ms. Bernhardt stepped off a plane straight out of Paris and landed on Roseanne's doorstep. She's got a full head of peonies with your choice of colour that are sure to add some whimsy and charisma to your Mom's day. As always, pre-ordering is the most important thing. We get A LOT of orders for Mother's Day, and, often, well in advance. So make sure you get your hands on all our new stuff before we run out! We're still two weeks away, so we still have some time left to order in more boxes, flowers, cacti, and all your other Mother's Day floral needs.